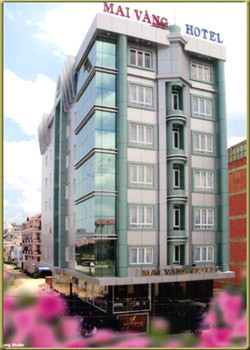 Near by the center of DaLat city, Mai vang Hotel is a excellent hotel for the tourists who come to DaLat. With the constructure of opening style, the hotel have many luxury and modernly rooms, with the windows and bancon view to the center of DaLat city, this bring up to our honoured guests feel confortable, freedom but also very carmly and privately. * Telephone to Domestic and Foreign country. * Car to take our guests from the airport. * Elevator convenience to go up or down. The restaurant will bring to the delicious meal with European Asian foods with many experiently Cookers of Mai Vang Hotel. Mai vang restaurant serve breakfast, buffet with a widely space enought for a large number of customer in one time. Suitable for celebating thuận tiện cho việc tổ chức hội nghị chiêu đãi .